It is a well-known fact of speed skating that higher altitudes mean faster times. At least that’s what we believed. Strangely, it has surfaced that certain elements within the administration of the Australian governing body for the sport of speed skating seem to have somehow missed this obvious tidbit of information. This combined with some rather unprecedented and, to put it lightly, idiotic rules means that to qualify for the upcoming season of world cups, the sea-level times of some skaters are being compared with high-altitude times of other skaters. Now, I do not wish to become embroiled in the politics of the sport, so I will withhold my opinion on the behavior of the governing body on this matter (for now). I will however comment on the technical aspect of this because, as I said previously, it is quite obvious. In the sport of speed skating, as much as 85% of the effort of a skater is used to overcome air resistance. The remainder is spent overcoming the friction with the ice and the body’s own biomechanics. Judging by the way that we are constantly told to get lower, and also from the seemingly absurd expense of the aerodynamic racing suits that we wear (a good one will cost at least 600 euro) we could probably have guessed that aerodynamics play a crucial role. 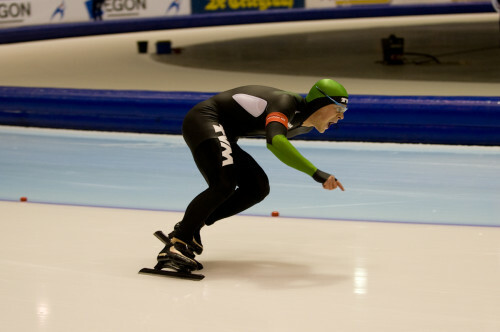 It is a well-known fact of speed skating that higher altitudes mean faster times. At least that’s what we believed. Strangely, it has surfaced that certain elements within the administration of the Australian governing body for the sport of speed skating seem to have somehow missed this obvious tidbit of information. This, combined with some rather unprecedented and, to put it lightly, nonsensical rules, means that to qualify for the upcoming season of world cups, the sea-level times of some skaters are being compared with high-altitude times of other skaters. First, the physics of it. is the force, is the air density is velocity is area is drag coefficient and is a direction vector for the velocity. The drag coefficient is determined by things like the shape of the skater, the makeup of the skating suit and various factors like that. The area is just the font-on cross section. The important variable here is air density . The air at a higher altitude is less dense than the air at a lower altitude. Why is this so? An easy way to think about it is to imagine a square on the ground and think about all of the air above that square – you’ve got a very tall column of air and all that air has weight to it and it’s pushing down. We don’t feel it because we’re used to it, the same way deep sea fish are used to the crushing depths of the ocean. Anyway, when you’re at some altitude, you’ve got a significantly smaller amount of air pressing down and therefore there is less air pressure. Since everything except and are constant. They’re all we really need to consider. So let’s take the typical temperature of a well-maintained speed skating facility to be about 5 degrees C (it’s usually much warmer) and take the Utah Olympic Oval (USA) and Thialf (Netherlands) as our two venues for comparison. Thialf, like much of the Netherlands is at sea level where the air density at that temperature is . By contrast, the Oval at Salt Lake City is about 1400m above sea level so the air density there is .1 The difference is 0.197. That may not seem like much, but it represents 15.5% of the force needed to overcome aerodynamic drag at sea-level. Even with a conservative estimate that aerodynamics accounts for only 80% of resistance that a skater must overcome, it is still at least a 12.5% difference, which is huge. Empirical evidence also seems to back up this claim. A quick glance at the track records for the venues mentioned above is quite revealing. The men’s records in particular are noteworthy because the record holders are often the same in a given distance. It seems that this difference translates to roughly a second a lap for the shorter distances where aerodynamics obviously play a bigger role. It is also noteworthy that all but one of the men’s world records were set at the Utah Olympic Oval. There have also been various claims that the discrepancy in times is, instead, due to skaters peaking at different points in the season. The implication here is that skaters happen to be physically peaked to coincide conveniently with being at altitude. Such claims may be safely dismissed as nonsense because plenty of important events are held at sea level (world single distances, world sprint, european all-round, and world all-round championships were all held at sea-level venues in the 2008-2009 season, a season in which two world records fell – none of them at sea-level). I can only hope that whoever sets the rules by which the Australian governing body governs can at least get this technical aspect of things right. The fair thing to do would be to either (1) include seasons-best times set during the previous season (which would include those set at altitude), or (2) assuming an insistence of only counting times from July 1st 2009 onwards in the selection process, to arrange for all eligible skaters to skate a competition prior to the start of world cups at the same venue (be it sea-level or otherwise). What they cannot and must not do, is continue to deny the laws of physics when considering times. The physics is sound. To further the point that it’s a profound difference, the oxygen intake at altitude is less than that at sea level, yet the times are still better at altitude. I wonder at which point the two would cancel (and where the optimal level would be) however that would require a table of efficiency calculations for each altitude at either an aggregate level. For true accuracy you would need more than empirical data and probably a formula for the biomechanics of efficiency and oxygen uptake based upon air density. Anyhow, it surprises me that the laws of physics don’t apply when making decisions as you’ve outlined (from the perspective of the Australian governing body). on the point of oxygen intake, the crossover point would be different for different events. You’d be able to get away with much higher altitudes for the 500m for example, than for the 5000m. On the whole, I think this point is somewhere between 1500 and 2500m but that is just a rough guess. Interestingly, the Australian selectors have recently amended their selection process to take altitude into account by using “equivalent sea-level times” based on a formula which uses different track’s track records to project an estimate. It’s a bit crude and imperfect, but has been shown to be surprisingly accurate. I should have also added that this is only really important for the first few events of the season, after which enough of the season has happened, and there have been enough big international events (where everyone is in attendance) that it becomes easy to see who is skating better than who. But this question from a track and field/ distance running person?? why is skating at altitude an aid while running at altitude a major handicap to top performance??? Curious in New Jersey??? well, it’s a question of trade-offs. In skating, the advantage of skating at altitude is less air resistance, but the disadvantage is less oxygen. The same applies to running. The major difference is that, in skating, the percentage of an athlete’s energy which is used to overcome air resistance is huge compared to running. This about this – if you’re skating at speed and you stop pushing how long does it take to come to a complete stop? Compare that to running, where most of an athlete’s energy is used to overcome biomechanical resistance. For running, the advantages to being at altitude become outweighed by the disadvantages at a much lower altitude than for skating. I wish i would have had you as my physics teacher, i might have actually taken the final exam then..
another point about the running, it’s a man-to-man thing, whereas longtrack speedskating is about the clock.. I raced marathons on sea level and high altitude, and found the latter much harder..